Day two of the Seamaster 2017 ITTF World Tour Platinum German Open in Magdeburg is underway and what a start to the day it has been for Japan after two of the country's doubles partnerships earned semi-finals victories on Saturday 11th November. The first success for a Japanese pairing came in the Women’s Doubles tournament as Hina Hayata and Miu Hirano recovered from a two games to one deficit to book their place in the final. 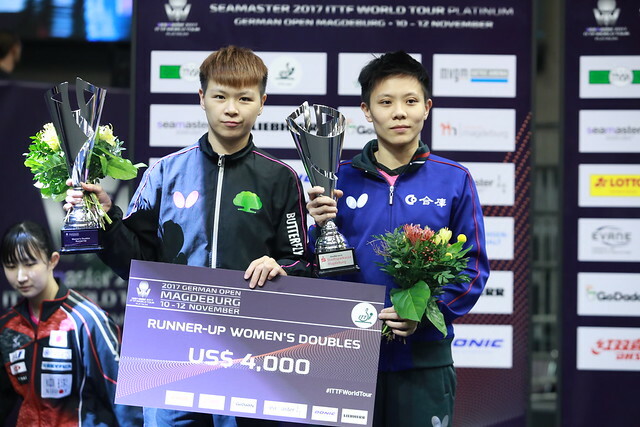 China’s Gu Yuting and Hong Kong’s Soo Wai Yam Minnie were in impressive form and were responsible for the shock quarter-finals elimination of Zhu Yuling and Chen Meng, the second seeds from China. However, despite a brave showing in the last four from the mixed nationality duo, it was the Japanese teenage team of Hina Hayata and Miu Hirano who ultimately came away with the win across five games (11-7, 3-11, 10-12, 11-6, 11-7). The other semi-finals encounter also went right down to the wire as Chen Szu-Yu and Cheng I-Ching saw off the top seeds Doo Hoi Kem and Lee Ho Ching of Hong Kong by a narrow three games to two margin (11-3, 6-11, 9-11, 11-8, 11-8), a result which gives the Chinese Taipei partnership confidence ahead of the gold medal match. “They have been playing doubles together for a longer period of time, so it’s a tough match for us. Now that we have won, we will be more confident for the finals”, Chen Szu-Yu. When the young Japanese pairing of Yuto Kizukuri and Tomokazu Harimoto stepped up to face Ho Kwan Kit and Wong Chun Ting at the Seamaster 2017 ITTF World Tour Platinum LION Japan Open in June the more experienced team emerged with a straight games win. However, the outcome was well and truly reversed in the penultimate round of the Men’s Doubles draw in Magdeburg with Kizukuri and Harimoto progressing through to the final with a powerful display against the duo from Hong Kong (15-13, 11-2, 11-4). “In Japan, they were very aggressive, so today we had to be aggressive as well in order to win. We are happy with the victory and now we have made our second Men’s Doubles final. In China, we lost the final, but this time we hope to win the title!”, Tomokazu Harimoto. Korea Republic’s Jeoung Youngsik and Lee Sangsu are the other title contenders in the event following their semi-finals success against Lam Siu Hang and Yu Ziyang (11-5, 11-8, 1-11, 11-3) of Hong Kong and China respectively.